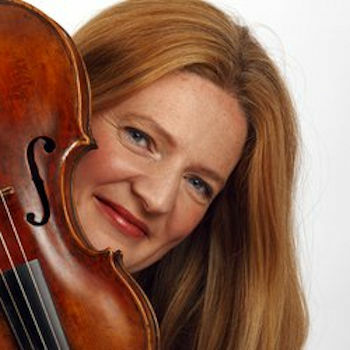 The violinist, whose previous recordings of Vivaldi have won widespread critical acclaim, talks to Katherine about taking on the 'Red Priest''s most popular work. The British violinist breathes new life into the most popular of baroque violin concerti with these vivid one-per-part accounts which exude wit and affection. Producer Jonathan Freeman-Attwood: ‘The irresistible characterpieces that pit solo violin against string ensemble in Vivaldi’s ‘Le Quattro Stagioni’ have reached the ears of millions over the last few generations. Most recordings adopt a strikingly similar approach to the scores, and familiarity has blunted the music’s edge: we have passed the point of rediscovery and have stopped listening intently to the freshness of Vivaldi’s invention. Working with Rachel Podger and Brecon Baroque has been an object lesson in starting anew and identifying the ingredients which make ‘Le Quattro Stagioni’ great works. Virtuosity is non-negotiable here and Rachel has it in abundance. But it’s the colour, poetry, vibrancy and evocative characterisation of weather, human warmth and fragility, captured by the dynamic flux of Rachel interlocking with her colleagues in Brecon Baroque, that deliver near-unimaginable qualities in this music. Part of the freshness stems from the interaction between Podger and her one-to-a-part ensemble. She’s first among equals and the dynamic couldn’t be further removed from the usual notion of the concerto as a vehicle for the all-conquering soloist…it’s striking just how many soloistic opportunities Vivaldi offers the ensemble…Musical details are incisively etched. [Podger] with a select group of eight musicians, one to each part. So far from sounding spartan, this releases a freedom and buoyancy in the playing that is quite delightful. The "nymphs and shepherds" dance in "Spring" with the lightest of steps. The horses gallop along in the "Autumn" hunt with a joyous, almost Disney-like cartoon bounce. The playing is high quality throughout and three more Vivaldi concertos, each as characterful in its own right, make up an enjoyable disc. It’s not just that the actual playing is superb: serene virtuoso fluency from Podger, gorgeously supported by her colleagues...It’s also that this is something genuinely, effortlessly and naturally different...I’ve never heard their every twist and turn served up as quite the succession of changing sound worlds as appears here. Podger’s approach is considerably more fine-boned than most, which is as much down to the choices about phrasing, tempi and articulation as it is to the forces deployed: Spring is ushered in with gentleness and grace... This is The Seasons as chamber-music rather than virtuoso war-horse, and the synergy between Podger and her tiny band is matchless. Podger’s Midas touch makes even a warhorse such as Vivaldi’s Four Seasons sound fresh-minted. She and her Brecon players see these concertos not as orchestral but as chamber music. Yet there is no lack of power in the big tuttis...This Vivaldi has an improvisatory quality, making you listen with cleansed ears. Why consider another recording? The answer lies in many things: Podger’s bouncy phrasing and clarity, myriad subtleties in textures and dynamics, the kindliness of a recording that, unlike some, allows the music and its reverberations to breathe...There’s also the exquisite balance of parts shared between Podger’s eight-strong ensemble.